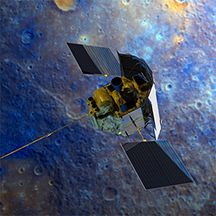 After more than 10 years in operation, the MErcury Surface, Space ENvironment, GEochemistry, and Ranging (MESSENGER) spacecraft impacted the surface of Mercury on April 30, 2015, at a speed of more than 3.91 kilometers per second (8,750 miles per hour), marking the end of operations for the hugely successful Mercury orbiter. 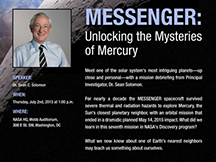 At the MESSENGER Nears End of Operations media and public event, scientists and engineers discussed the mission’s accomplishments, providing the top 10 scientific discoveries, as well as the technological innovations that grew out of the mission. 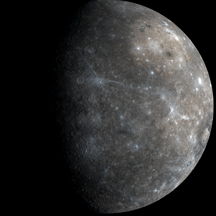 MESSENGER measurements have revealed that Mercury is surprisingly abundant in volatile elements that evaporate at moderately high temperatures, ruling out many of the models for its formation and early history that had been proposed before the mission. Because potassium is much more volatile than thorium, the ratio of the abundances of these two elements is a sensitive measure of thermal processes that fractionate elements by volatility. For Mercury, as seen in the first graph, this ratio is similar to that for other terrestrial planets at greater distances from the Sun but significantly higher than that for the Moon, which lost potassium during the giant impact that led to its formation. Particularly high potassium concentrations were observed by MESSENGER's Gamma-Ray Spectrometer at high northern latitudes, as illustrated in the abundance map on the left side of the animation. Relatively high abundances of other volatile elements, including sulfur (right side of the animation), sodium, and chlorine, provide further evidence that Mercury is volatile-rich. 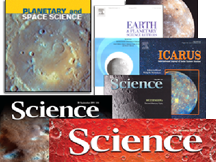 The high sulfur contents combined with low amounts of iron on the planet's surface additionally indicate that Mercury formed from materials with less oxygen than those that formed the other terrestrial planets, providing an important constraint on theories for the formation of all of the planets in the inner Solar System. MESSENGER has provided multiple lines of evidence that Mercury’s polar regions host water ice. Shown here is a view looking down on Mercury’s north polar region, with 0° longitude on the bottom of the view and extending to 65°N latitude. The first frame shows an Earth-based Arecibo radar image in red overlaid on a mosaic of MESSENGER’s Mercury Dual Imaging System images, enabling for the first time the identification of the host craters for all of the radar-bright deposits. The second frame shows the topography of the region as measured by MESSENGER’s Mercury Laser Altimeter (purple: about 5 km below average surface elevation; red: about 5 km above average surface elevation); illumination models derived from the topography show that the radar-bright deposits are located in regions of permanent shadow. The third frame shows a longitudinal average of the neutron flux over the polar region obtained by MESSENGER’s Neutron Spectrometer; the decreased neutron flux at higher latitudes is evidence for the presence of hydrogen (as in water ice) in Mercury’s polar region. The fourth frame shows a map of Mercury’s maximum surface temperature, modeled from the topography. The temperatures range from 50 K (purple) to >550 K (red). The permanently shadowed craters near Mercury’s north pole have thermal environments that allow water ice to be stable in these craters either at the surface or a few tens of centimeters below the surface. Observations by MESSENGER’s Magnetometer showed that Mercury’s magnetic field is offset along the planetary spin axis by about 20% of the planet’s radius. The internal magnetic field is 100 times weaker than that of Earth and barely stands off the solar wind at the subsolar point to form the magnetosphere. The interaction of the planetary field with the solar wind generates currents in the magnetosphere, which induce external magnetic fields with magnitudes similar to or larger than the planetary field in much of the magnetosphere. Hollows are shallow, irregular depressions and are a geologic landform discovered by MESSENGER that appears to be unique to Mercury. Hollows are also some of the brightest and youngest features on Mercury’s surface. The floor of the 32-kilometer-diameter crater Kertesz (centered at 27.36°N, 146.11°E), shown here, is extensively covered with hollows. The formation of hollows remains an active area of research, but the etched nature of the features, such as in this image, suggests that material is being lost from the surface to create the hollows. Volcanism has played a critical role in shaping Mercury’s surface. The scene begins with Timgad Vallis near the top of the screen and Angkor Vallis near the bottom. Both valleys formed by the mechanical and thermal erosion of Mercury’s surface by hot, quickly flowing lavas. The movie follows Angkor Vallis into the large crater Kofi (136 km diameter, centered at 56.74°N, 118.08°E), which has been flooded with lava. The second part of the movie illustrates the remarkable range in elemental abundances displayed by the volcanic deposits that make up Mercury’s surface. In these global views, the Caloris impact basin is initially in the center, and the colors on the spinning globes represent the ratios by weight of magnesium to silicon and aluminum to silicon. Silicon is known to be relatively homogenous across the surface, so these maps demonstrate variations in the abundances of magnesium and aluminum, both of which are sensitive to the details of the interior melting that produced the lavas that formed the surface volcanic deposits. This image provides a perspective view of the central portion of Carnegie Rupes, a large tectonic landform that cuts through Duccio crater (133 km diameter, centered at 58.19°N, 307.6°E; north is to the left). The image shows topographic heights as measured by the Mercury Laser Altimeter and surface features mapped by the Mercury Dual Imaging System. Variations in topography are shown in color (red: high-standing terrain; blue: low-lying terrain). Tectonic landforms such as Carnegie Rupes formed by horizontal shortening in response to cooling and contraction of the planetary interior. MESSENGER results have shown that Mercury contracted by as much as 7 km in radius, a number substantially larger than previously believed. Mercury’s tenuous atmosphere scatters sunlight, and the brightness of the emission is proportional to its content. Scattered sunlight gives sodium a bright orange glow, which was observed by the Mercury Atmospheric and Surface Composition Spectrometer to vary seasonally with Mercury’s distance from the Sun. In the animation, which spans more than two Mercury years, orange indicates high concentrations of sodium, and blue indicates low concentrations. During parts of a Mercury year, the radiation pressure from the scattering process is sufficiently strong to strip much of the atmosphere and form a long glowing tail. Someone standing on Mercury’s nightside at the right time of year would see a faint orange similar to a city sky illuminated by sodium streetlights. Mercury’s magnetosphere is highly dynamic because of the planet’s small magnetic field and proximity to the Sun. The interaction of the solar wind with the planetary field generates waves in particles and fields, and reconnection of interplanetary and planetary magnetic field lines and circulation of magnetic flux in the magnetosphere occur 100 times faster than at Earth. This animation shows the temporal evolution of ion density in the equatorial plane, looking down from the north pole. Kelvin-Helmholtz surface waves form at the magnetopause near the sub-solar point and grow as they move anti-sunward. The mixing of solar wind and magnetospheric plasma is just one of many processes that cause Mercury’s magnetosphere to be highly dynamic. Features of the simulation are consistent with observations by MESSENGER’s Magnetometer and Energetic Particle and Plasma Spectrometer. Courtesy of Jan Paral, National Center for Atmospheric Research. A puzzle raised after brief observations by the Mariner 10 spacecraft was the nature of apparent bursts of energetic particles. Because of instrument limitations, neither the identity of these particles—ions or electrons—nor their energy was known. MESSENGER’s payload includes instruments specifically designed to address these questions. Only after the MESSENGER spacecraft entered orbit about Mercury was the initial part of this puzzle solved. The energetic particles are electrons, not ions, and they have energies from several thousands of electron volts to 100 times that energy. Electrons with energies in excess of 1000 electron volts (1 keV) can produce X-rays by hitting parts of the spacecraft or instruments. This process allows electrons with energies lower than the nominal threshold of the Energetic Particle Spectrometer (about 35 keV) to be detected by their X-ray signature in MESSENGER’s X-Ray Spectrometer (XRS). This animation shows the location of the more than 3000 XRS signatures of such events detected during MESSENGER’s orbital mission (from 10 April 2011 through 5 March 2015). The electrons are seen at all local times (the Sun is at local noon) and within a planetary diameter of the center of Mercury, although more tend to be located near dawn. These electrons are thus a quasi-permanent feature of Mercury’s magnetosphere. The sources and loss process for these energetic electrons remain under study. Magnetic field observations by the MESSENGER spacecraft in orbit about Mercury revealed flow of electric current from the magnetosphere to low altitudes along magnetic field lines. These field-aligned, or Birkeland, currents flow downward (blue) at dawn and upward (red) at dusk and have magnitudes 100 times smaller than at Earth. Models for the electrical conductivity of the planet suggest that the currents flow radially through the low-conductivity layers near the surface and laterally from dawn to dusk through more conductive material at depth. When MESSENGER was designed, the challenging thermal environment near Mercury was among the chief concerns. With propellant mass limitations, MESSENGER’s evolving orbit about Mercury, and limits to mission operations set by the budget, focus was on an initial orbit with a low periapsis that would be survivable thermally and could be adjusted back to its initial value periodically. The latter need was because the gravitational pull of the Sun caused a drift of the periapsis with succeeding orbits. Early in the orbital phase of the mission, that drift was upward; for the last two years that drift has been downward. The continued health of the spacecraft and payload together with compelling new science questions raised by earlier orbital observations led to a final phase of the mission during which the periapsis altitude would be allowed to drift well below 50 km and the last remaining propellant would be used to execute frequent maneuvers to keep the periapsis near the planet’s surface while carefully monitoring the temperature of all spacecraft systems. This “hover” campaign, during which MESSENGER’s periapsis altitude has been held between 35 and 5 km, has allowed for extraordinarily low-altitude measurements, especially with MESSENGER’s Neutron Spectrometer and Magnetometer. Limited only by the remaining helium pressurant—now being employed for maneuvers following the depletion of all usable hydrazine fuel—this final MESSENGER observational campaign has postponed the inevitable, MESSENGER’s impact onto Mercury’s surface. This plot shows the periapsis altitude (km) throughout the current “hover” campaign, as it drifts down toward the planet surface and is adjusted by periapsis-raising orbit-correction maneuvers (OCMs). MESSENGER’s mission duration is limited by the amount of onboard propellant, because the Sun’s gravity perturbs the spacecraft orbit and is currently forcing the minimum altitude to ever-lower values. On 6 April 2015, MESSENGER exhausted the last of its liquid hydrazine while executing a maneuver to help delay surface impact. Rather than let the depletion of fuel end the mission, MESSENGER’s engineers turned to the onboard helium gas previously used only to pressurize the propellant tanks. This gas can be expelled out of the same thrusters that formerly combusted liquid rocket fuel for propulsion. With careful planning, this helium gas is expected to add several weeks to the life of the mission. MESSENGER is the first spacecraft to rely on the onboard pressurant to extend mission life. As with any complex undertaking, there is much work “behind the scenes.” MESSENGER began as a mission concept 19 years ago. Following selection for flight in 1999 and the beginning of the project in January 2000, more and more individuals contributed to the MESSENGER concept, design, spacecraft, and mission: engineers, scientists, technicians, support staff, managers, and subcontractors. Following launch some team members changed, and others remained, as mission phases, tasks, and needs evolved. Not unlike a village—and an international one at that—there is a human face of MESSENGER intricately interwoven with the mission and its scientific triumphs. MESSENGER’s trajectory relied heavily upon six planetary gravity assists, as these flybys provided a substantial portion of the change in spacecraft velocity required to execute the mission. Each gravity assist was designed to provide a specific adjustment to the trajectory, but this objective could be accomplished only by flying past the planet at the desired location (see crosshairs in inset image). MESSENGER did not have sufficient propellant to make up for large errors in the trajectory that would result from an errant gravity assist, so precision targeting at these encounters was essential to the successful execution of the mission. Missions typically use a series of propulsive targeting maneuvers to achieve the required accuracy. Because of MESSENGER’s proximity to the Sun, project engineers were able to capitalize on the subtle but persistent force that sunlight exerts on the spacecraft to eliminate the need for these propulsive targeting maneuvers for each of the three Mercury flybys and on the approach to the orbit insertion maneuver. This method reduced the amount of propellant required to navigate these planetary encounters. Perhaps more importantly, by eliminating these complex propulsive maneuvers, the risk to the successful collection of scientific data during the flyby campaigns was reduced. Spacecraft commanding requires attention to minute detail, because any mistake could end the mission. This issue is compounded by the great distance between Mercury and Earth: a wrong command could put MESSENGER’s sunshade in the wrong direction, overheating critical spacecraft systems before the ground operations crew could learn of the problem, much less intervene. All of MESSENGER’s commands must thus be carefully designed, checked, and double-checked, and then transmitted to the spacecraft for storage in the onboard processors for later execution. And while the spacecraft must be protected, there is a long menu of scientific observations that must be completed to meet mission requirements, some keyed to particular combinations of locations and lighting conditions. Resources on the spacecraft must also be considered, including the maximum number of storable commands, the capacity of the solid-state recorder to store data prior to downlink, times of downlink windows, and data rates. To deal with all of these requirements, as well as to re-plan operations rapidly in the event of mission anomalies, a science planning software tool was developed to plan MESSENGER science acquisition sequences. This software tool, SciBox, had been used previously to help with planning individual instrument sequences on other missions, in particular the Magnetospheric Imaging Instrument on Cassini and the Compact Reconnaissance Imaging Spectrometer for Mars on the Mars Reconnaissance Orbiter, but the first use of SciBox for planning, optimizing, and generating command sequences for observations with a multiple-instrument payload on a full mission has been with MESSENGER. SciBox takes mission parameters, observation requirements, and individual instrument commands and generates command-sequence loads that can then be uploaded for execution on the spacecraft. By minimizing the person-in-the-loop portion of sequence development, observations can be optimized and rapidly implemented for the full instrument suite. Above, we see an animation showing spacecraft attitude adjustments (accelerated) as commanded by SciBox in support of science operations. Deep-space missions typically use a parabolic dish antenna to communicate with Earth. These dishes offer high-volume data return from missions, but they are unsuitable for MESSENGER because they are heavy and intolerant of the extreme ranges in temperature at Mercury. Instead, MESSENGER engineers borrowed a design from a military space application whereby the antenna remains fixed to the spacecraft and can be steered to track Earth electronically. This design eliminated the need for gimballing; reduced mass, complexity, and the risk of mechanical failure; and enabled high-bandwidth communication despite a highly constrained spacecraft attitude. These antennas have helped telemeter more than 10 terabytes of science data through MESSENGER’s three Mercury flybys and four years of orbital operations. Most spacecraft use solar cells mounted in the form of solar arrays to provide electrical power for their operations, and MESSENGER is no exception. At Mercury’s distance from the Sun, however, the panels are subjected to substantial heating. From the time of launch until the solar array was deployed shortly thereafter, the spacecraft relied on onboard battery power. The battery was also designed to provide power when the spacecraft is in the shadow of the planet. MESSENGER’s dual solar panels had to provide sufficient power to operate the spacecraft near Earth but not overheat in Mercury orbit. MESSENGER’s solar arrays are fashioned as interleaving strips of highly efficient (28%), triple-junction solar cells and optical solar reflectors of twice the cell widths. As the spacecraft moved inward toward the Sun, the array temperatures were carefully monitored. To maintain a safe operating temperature (typically 150°C), the arrays were rotated away from the Sun, which decreases the electrical power available but also reduces the temperature. This strategy allowed between 385 and 485 W of power during cruise and about 650 W of power during the orbital phase of the mission. MESSENGER’s 22-cell, 23 ampere-hour, nickel-hydrogen battery continues to provide power during eclipses. MESSENGER’s solar arrays have degraded somewhat in their power output after long exposure to the harsh thermal and radiation environment near Mercury. Moreover, as the spacecraft has come closer and closer to the planet’s dayside surface during the extended mission, higher operating temperatures have been accepted, peaking above 200°C. The solar panels and battery nonetheless continue to provide adequate power for spacecraft and science payload operations for the remainder of the mission. This animation shows the deployment of the solar panels shortly after launch, followed by a photograph of a solar panel during the integration and test phase of the mission. Achieving orbit about Mercury was a tremendous engineering milestone, but survival at the innermost planet required an innovative thermal design. The dominant feature of the spacecraft design is the ceramic cloth sunshade, which isolates the sensitive instruments and electronics from direct solar radiation. The front side of the sunshade routinely experiences temperatures in excess of 300°C (570°F), whereas the majority of components in its shadow routinely operate near room temperature (20°C or 68°F). The sunshade is extremely effective at isolating most of the vehicle from the Sun’s radiation, but reflected infrared radiation from Mercury greatly influences the temperatures of MESSENGER’s components behind the sunshade. The influence of Mercury is effectively managed with careful selection of vehicle orientation, to balance heating across the spacecraft, as well as an intricate system of heat pipes and radiators. Although counterintuitive, the thermal design must be tolerant of extremely low temperatures as well, because the spacecraft frequently passes into the shadow of the planet, cooling the vehicle substantially. MESSENGER relies on heaters during these eclipse periods to keep the vehicle components within a comfortable temperature range. 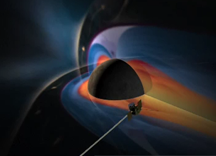 As a low-cost spacecraft in NASA’s competed Discovery Program, MESSENGER had to balance costs against capability; as spacecraft mass increases, both capability and costs rise. So the challenge for MESSENGER was to pack as much capability as possible in as low a mass as possible, all while dealing with large distances and a challenging thermal and radiation environment. More than half propellant at launch, MESSENGER had to be able to provide a speed change of more than 2200 m/s following launch. Keeping all the required capability in a small spacecraft meant that during development, all the parts had to be assessed carefully for their mass and size, and the spacecraft mass had to be tracked to a weight of less than an ounce (~28 grams) as it was designed, manufactured, and assembled. 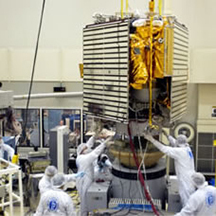 The assembled spacecraft is dominated by the 2.5 by 2 meter (approximately 8 by 6 foot) sunshade that shields the spacecraft itself from the searing heat of the Sun, which can be 11 times as great as it is at Earth. Following a trajectory that required six planetary flybys, six propulsive maneuvers, 600 kg of propellant, and 6.6 years, MESSENGER became the first spacecraft to orbit the innermost planet in our Solar System, and the only one to date. The mission used a complex sequence of rocket burns and planetary gravity assists to approach synchronization with Mercury’s orbital speed. To enable such a trajectory, mass at launch was more than half propellant, and more planetary flybys were required than for any other mission to date. To address key science questions about Mercury's formation and evolution, MESSENGER journeyed through the inner solar system and became the first spacecraft ever to orbit Mercury. Learn about the details of the spacecraft and find details about MESSENGER's science payload, which included seven scientific instruments and a radio science experiment. The MESSENGER Team is composed of many different individuals with a wide variety of roles and responsibilities. Scientists and engineers from across the country are involved in all aspects of the mission. View images and other data acquired by MESSENGER and learn about the science they taught us about Mercury. Watch videos, browse photos, and listen to podcasts! 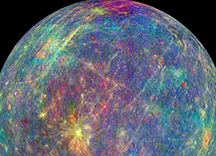 Explore Mercury your way, using interactive tools to visualize the MESSENGER datasets. How did we get to Mercury? What were the challenges and triumphs? What did we discover? Learn more with these engaging materials for inside and outside of the classroom. Roll up your sleeves and find out why it was such a challenge to study the planet closest to the Sun. Then interact with real data and images from this historic mission. Foster the problem-solving and critical-thinking skills required for space exploration with these hands-on, minds-on learning modules. 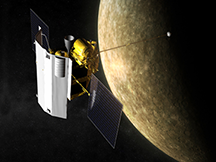 Read fourteen years of MESSENGER news releases covering all mission phases—development, integration and testing, launch, the 6.6-year journey through the inner solar system, and ultimately exploration of Mercury from orbit. View MESSENGER press conference presentations and learn about presentations made by MESSENGER team members at other venues. 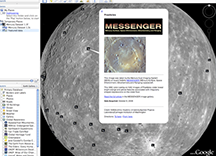 See a bibliography of publications by project team members about the MESSENGER mission and related Mercury science, dating back to when NASA first selected the MESSENGER mission in 1999.